The book was pretty clear on how you should put it up, although I ended up not using the amplifier on the circuit – just plugged in directly to the speakers. 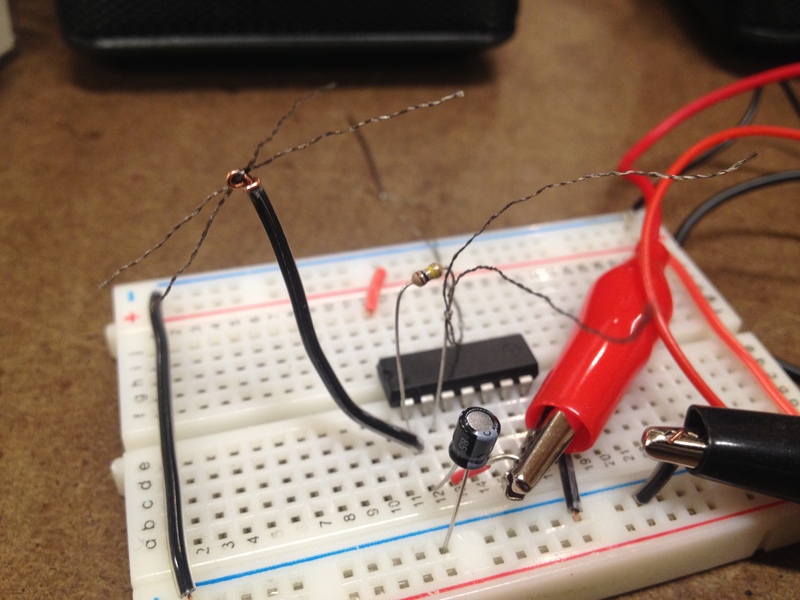 It worked and then I decided to try a different kind of resistor to create variations of the frequency played. I started testing with thread, to see if it was possible to make a “performatic” synth, in which the frequencies vary while I sew with conductive thread. So I tided piece o conductive thread on a conductive wire between the capactiro and the chip and stiched it on a fabric (tighten on a loop) . I tied another piece on the resistor (when there was no resistor it wouldn’t make any sound) and put the needle on it. 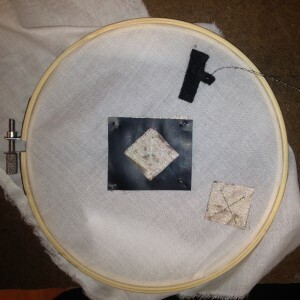 When I started sewing / crossing the conductive threads, they would make the sound stop – which I didn’t understand exactly but I also saw that when I had my finger on both threads, then it would vary the frequency – messing a little with the conductive thread that was connected to the capacitor was what made the signal change. So I also got some conductive fabric and saw that the frequency variability would vary with the pressure/how many fingers I had on and if I put a velostat between the two pieces of conductive thread. The result you’ll see on the video bellow. The sounds are really weird and following the book’s advise : if it sounds good and you don’t understand why, don’t worry and move on. My final project will be a more developed/finalized version of the midterm. Playing with the idea of disorientation, it will be a sound installation in which the public is invited to stand between two sound sources that are emitting sine waves that phase shift each other. When two frequencies are slightly different one from the other, they give the sensation of being out of balance because it affects the inner ear, essencial part of the body that “captures” the movement direction (up/down,left/right,tilt). After the experience of the midterm I’ve realized that to have the effect as precise as possible, I have to use a different sound source, fix them in some way that whoever is in between them they can be affected by both sign waves.